(Induction.1.1) Enter Beggar, CHRISTOPHERO SLY, and HOSTESS. 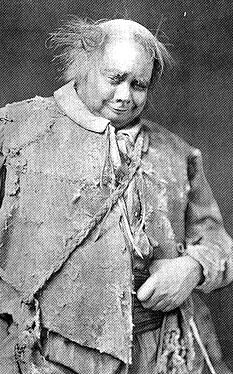 Sly, a drunken tinker, is thrown out of an alehouse, then falls fast asleep. (Induction.1.16) Enter a LORD from hunting. A nobleman, returning from a hunting trip, sees the sleeping Sly and decides it would be a good joke to dress him in luxurious clothes, put him in a soft bed, and persuade him that he is actually a lord who has been sleeping, and who has only dreamed of being a beggar. A troupe of traveling actors shows up. The nobleman tells them that they can assist him in his "sport"; they are to perform for a "noble lord" (i.e., Sly) who has never before seen a play. The nobleman tells one of his servants to have the lord's page, "Barthol'mew," dress as a fine lady, and pretend to be the noble wife of the fine lord who Sly is to become. (Induction.2.1) Enter the drunkard with ATTENDANTS; some with apparel, basin and ewer, and other appurtenances; and LORD. The nobleman and his servants persuade Sly that he is really a lord. Sly would like his lady to come to bed with him, but is persuaded to see a comedy instead. (1.1.1) Enter LUCENTIO and his man TRANIO. Lucentio arrives in Padua to study philosophy. (1.1.48) Enter BAPTISTA, KATHARINA, BIANCA, GREMIO, and HORTENSIO. LUCENTIO and TRANIO stand by. As Lucentio and Tranio watch, in comes Katharina the shrew, her dad (Baptista), her cute younger sister Bianca, and two guys, Hortensio and Gremio (who is really old). Both Hortensio and Gremio want to woo Bianca, but Baptista insists that Bianca cannot be married until "I have a husband for the elder." He tells the guys that they are free to woo Kate, and that Bianca, his good girl, does "most delight / In music, instruments and poetry," so if they know of good schoolmasters, they should send them to him. Left alone with the angry shrew, the two men mock Katharina; she returns the mockery and storms out. Gremio and Hortensio both vow that they will find teachers for Bianca, and then they agree to join forces in finding a husband for Kate. (1.1.146) Exeunt GREMIO and HORTENSIO. Lucentio is now crazy in love with Bianca and arranges for his servant Tranio to pretend to be him, while he disguises himself as a schoolmaster, so he can woo Bianca. (1.1.249) Exeunt [Lucentio, Tranio, and Biondello]. The presenters above speak. In the balcony at the back of the stage, Sly is nodding off, and wishes the play were over. (1.2.1) Enter PETRUCHIO and his man GRUMIO. Petruchio has come to Padua to visit his friend Hortensio, and asks his witty servant, Grumio, to knock at Hortensio's gate. Instead, Grumio jokes around, and Petruchio wrings his ears. Hortensio, hoping to find a husband for Katharina, describes her to Petruchio, and Petruchio jumps at the chance to marry a beautiful, wealthy shrew. So that he can woo Bianca, Hortensio is going to disguise himself, and asks that Petruchio help him out by introducing him to Baptista as a music master. (1.2.140) Enter GREMIO, and LUCENTIO disguised [as a schoolmaster]. Gremio has found a schoolmaster for Bianca; unkown to Gremio, it's Lucentio in disguise. Hortensio persuades Gremio to join in providing the expenses for Petruchio to woo Katharina, so that she will be married off and out of the way. (1.2.218) Enter TRANIO brave [disguised as Lucentio], and BIONDELLO. Tranio (disguised as Lucentio) comes to woo Bianca, and agrees to also assist Petruchio in his wooing expenses. (2.1.1) Enter KATHARINA and BIANCA. Katharina has tied Bianca's hands with a rope and tries to get her to say who she loves best, Hortensio or Gremio. When Bianca denies that she has special feelings for either one, Katharina beats her. Baptista saves Bianca from Katharina's jealous rage; Katharina exits, vowing revenge. (2.1.39) Enter GREMIO, LUCENTIO in the habit of a mean man; PETRUCHIO, [with HORTENSIO disguised as a musician; and] TRANIO [disguised as Lucentio] with his boy [BIONDELLO] bearing a lute and books. A crowd of men come in, all eager to woo a daughter of Baptista. Gremio presents a schoolteacher for Bianca, Cambio (who is Lucentio in disguise, though Gremio doesn't know that). Petruchio declares that he wants to marry Katharina and presents another schoolteacher, Litio (Hortensio in disguise). A stranger to Baptista, Tranio (disguised as Lucentio), presents a gift of books for the education of Baptista's daughters. "Litio" is sent inside to give music lessons. Petruchio gets right down to business, and he and Baptista quickly agree on the terms of Katharina's dowery and inheritance. Petruchio, upon hearing from Baptista that he must get Katharina's love, bursts into boasting that he is sure of success. 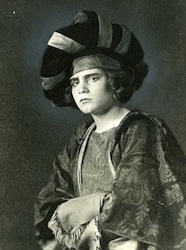 (2.1.142) Enter HORTENSIO [disguised as Litio], with his head broke. Hortensio returns with his head bleeding because Katharina broke a lute over it. Petruchio declares that he is even more eager than ever to meet her. Baptista takes everyone else away, and promises to send Katharina to Petruchio. (2.1.168) Exeunt [all but] Petruchio. Alone on stage, Petruchio shares with us his strategy for wooing the shrew: he is going to pretend that her shrewishness is its opposite. For example, if she scolds, Petruchio will "tell her plain / She sings as sweetly as a nightingale." After a long wit-combat, Petruchio declares that he is the perfect husband for Katharina. (2.1.281) Enter BAPTISTA, GREMIO, and TRANIO [disguised as Lucentio]. Katharina curses her father for trying to marry her off to a madman and when Petruchio says that they will be married on Sunday, she exclaims, "I'll see thee hang'd on Sunday first." But Petruchio, cheerfully lying, says that he and Katharina have agreed that she will be a shrew in public, but loving to him in private. Katharina says nothing more, and Baptista announces that Petruchio and Katharina are engaged. (2.1.325) Exeunt PETRUCHIO and KATHARINA. Baptista announces that the man who can offer the best dowry will get Bianca's hand in marriage. "Lucentio" (Tranio in disguise) wins the auction, but he will have to prove that his father approves of the deal. (3.1.1) Enter LUCENTIO [disguised as Cambio], HORTENSIO [disguised as Litio], and BIANCA. Lucentio and Hortensio quarrel over who is going to teach Bianca her lessons first, but Bianca says that she will decide, and chooses Lucentio. Each man, under the pretense of teaching a lesson, pleads his case to Bianca, and it becomes clear that Bianca favors Lucentio. (3.2.1) Enter BAPTISTA, GREMIO, TRANIO [disguised as Lucentio], KATHARINE, BIANCA, [LUCENTIO disguised as Cambio,] and others, attendants. Everyone is waiting for Petruchio, who is already late for his own wedding. Katharina, in her wedding dress, declares that Petruchio is just a practical joker; she storms out, weeping. Biondello comes to announce the arrival of Petruchio and Petruchio's servant, Grumio. Biondello describes the outlandish apparel of both men. (3.2.87) Enter PETRUCHIO and GRUMIO. Petruchio's clothes are shocking, especially to Tranio, who offers to lend him clothes appropriate for a wedding, but Petruchio declares, "To me she's married, not unto my clothes," and goes off to greet his bride. 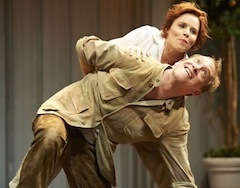 (3.2.124) Exeunt PETRUCHIO and GRUMIO. Alone with Lucentio for a moment, Tranio informs him that he has to find someone to pretend to be Vincentio, Lucentio's father, so that Baptista will believe that the dowry will be paid. Lucentio thinks that maybe he'd better just elope, and Tranio says that that might be arranged. 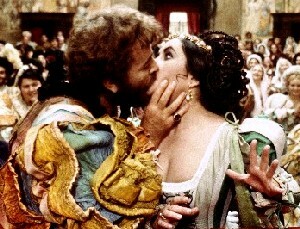 Gremio describes the wild marriage of Petruchio and Katharina, during which Petruchio threw wine in the sexton's face and kissed Katharine "such a clamorous smack / That at the parting all the church did echo." (3.2.184) Enter PETRUCHIO, KATE, BIANCA, HORTENSIO, BAPTISTA, [GRUMIO and TRAIN]. Petruchio announces that he will not stay for the wedding feast, but is leaving immediately. Everyone entreats him to stay, include Katharina. When he calls for his horse, Katharina says he can go, but she is staying. Petruchio's response is to pretend that the others are trying to steal her from him, and so he takes her away, saying that he'll protect what is his own. (3.2.240) Exeunt Petruchio, Katharina, [and Grumio]. 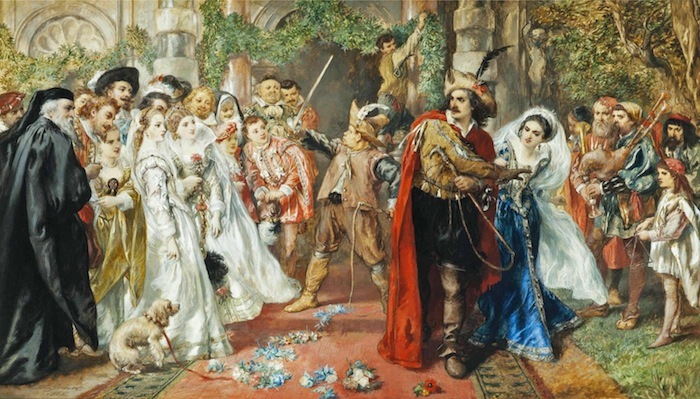 The departure of Petruchio and Katharina leaves everyone laughing; they all agree that Katharina is "madly mated," and they go in to enjoy the wedding feast. Grumio comes into Petruchio's house, complaining about the terrible journey he has had with Petruchio and Katharina. He calls to Curtis, another servant, to make him a fire, and tells the story of how Katharina's horse fell, and how Petruchio, instead of rescuing her, started to beat him. The upshot of all was that Katharina had to drag herself out from under the fallen horse and rescue Grumio from Petruchio. Grumio then assembles all of the servants, a motley crew, to greet Petruchio and Katharina. (4.1.120) Enter PETRUCHIO and KATE. Petruchio storms about, finding fault with everything, throwing things, and beating the servants. When food is brought, he sends it away. Katharina tries to protest that the food would be fine if only Petruchio wouldn't find fault, but Petruchio declares that it is burnt and they will fast until tomorrow. Meanwhile, he will take her to see the bridal chamber. (4.1.179) Exeunt [Petruchio and Katharina]. Enter SERVANTS severally. Petruchio's servants are amazed and amused at Petruchio's performance. One comments, "He kills her in her own humor," and another reports that Katharina "Knows not which way to stand, to look, to speak." The servants scatter, and Petruchio, alone on stage, tells us his current plan. He's going to find fault with everything (pretending that "all is done in reverend care of her") and thus keep her from sleeping or eating until she is tame. (4.2.1) Enter TRANIO [as Lucentio] and HORTENSIO. Hortensio has just told "Lucentio" (Tranio in disguise) that Bianca is in love with the Latin teacher (the real Lucentio, also in disguise). "Lucentio" expresses shock, and Hortensio says that he can see for himself by observing Bianca and the Latin teacher together. (4.2.6) Enter BIANCA and LUCENTIO. As Hortensio has said, it's obvious that Bianca has fallen for Lucentio. Tranio professes utter shock that Bianca has gotten involved with a lowly Latin teacher, and he makes an agreement with Hortensio that neither of them will wed Bianca. Hortensio goes off to marry a widow who he knows has long loved him. Tranio explains to Lucentio and Bianca how he has gotten rid of Hortensio, and says that Hortensio has gone to Petruchio's "taming-school" to learn how to tame his future wife. Biondello rushes in with the news that he has spotted a pedant who is a likely candidate to be a stand-in for Lucentio's father, Vincentio. Tranio sends Lucentio and Bianca away, so that he can talk the pedant into taking on the role of Lucentio's father and guaranteeing the dowry that Tranio (as Lucentio) has promised to Baptista, Bianca's father. (4.2.72) Exeunt LUCENTIO and BIANCA. Enter a Pedant. (4.3.1) Enter KATHARINA and GRUMIO. At Petruchio's house, Katharina begs Grumio for some food, but he only teases her with the possibility of food, and she beats him. (4.3.36) Enter PETRUCHIO and HORTENSIO with meat. Petruchio brings in a dish of food, and extracts a "thank-you" from Katharina, but before she has a chance to eat anything, he calls in a Tailor and Haberdasher with her new clothes. The Haberdasher presents a new cap, and the Tailor a new dress. Katharina loves them, but doesn't get them. When she tries to protest, Petruchio congratulates her on agreeing with him that both the cap and dress are not good enough for her. When the Tailor protests that he made the dress exactly according to instructions, Grumio comically challenges him to a duel. The Tailor is sent away, though Petruchio instructs Hortensio to make sure that the Tailor is paid. Petruchio announces that they will go to Katharina's father's house in the clothes they have, "For 'tis the mind that makes the body rich." He also says it's seven o'clock in the morning; when Katharina says it's two in the afternoon, Petruchio says that before they go, "It shall be what o'clock I say it is." (4.4.1) Enter TRANIO [as Lucentio], and the PEDANT dress'd like Vincentio. Tranio (disguised as Lucentio) leads the Pedant towards Baptista's house, where the Pedant will pretend to be Vincentio, Lucentio's father, and finalize the marriage contract with Baptista, Bianca's father. Baptista appears with Lucentio (still disguised as Cambio, the Latin teacher), and Baptista and "Vincentio" (the Pedant) quickly come to agreement about the marriage. The papers are to be signed at Lucentio's lodgings, and Baptista sends "Cambio" to tell Bianca to prepare herself to marry Lucentio. (4.4.73) Exeunt [Tranio, Pedant, Baptista, and Peter]. Enter LUCENTIO [as Cambio] and BIONDELLO. Biondello catches up with Lucentio and tells him there's more to Tranio's plan. While Baptista is safely out of the way, "talking with the deceiving father of a deceitful son," there is a priest ready to marry Lucentio and Bianca. Lucentio has only to talk Bianca into an elopement, but he is sure that he can do it. (4.5.1) Enter PETRUCHIO, KATE, HORTENSIO. On their way to Katharina's father's house, Petruchio comments on how bright the moon is. When she protests that it's the sun which is shining, not the moon, he throws a hissy fit, and Hortensio says to her, "Say as he says, or we shall never go." So Katharina vows that she will from henceforth agree with anything Petruchio says. An old man appears; Petruchio greets him as "gentle mistress" and asks Kate if she has ever seen a "fresher gentlewoman." Kate follows Petruchio's lead, and speaks effusively to the "young budding virgin." Petruchio then corrects her, telling her that she is speaking to an old man, and Kate apologizes for her "mad mistaking." After this practical joke, Petruchio tells the old man that they will be happy to accompany him on his journey, if he is going their way. He is. He is Vincentio, the real Lucentio's real father. Petruchio announces that they are relatives, since Vincentio's son has married Kate's sister, Bianca. Petruchio goes on to assure Vincentio that Bianca is well-born and wealthy, and Lucentio "will of thy arrival be full joyous." As the rest go off, Hortensio stays behind for a second to reflect on what he has seen. 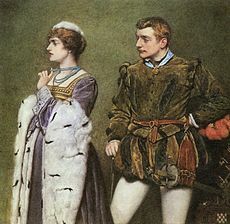 His conclusion is that he can tame the widow he is going to marry with the same techniques that Petruchio has used on Kate. (5.1.1) Enter BIONDELLO, LUCENTIO, and BIANCA; GREMIO is out before. While Gremio is wandering about, looking for Cambio to report to him on his success in wooing Bianca on Gremio's behalf, "Cambio" (Lucentio) is stealing away with Bianca to be married. Biondello goes with Bianca and Lucentio, and Gremio doesn't see anything. (5.1.8) Enter PETRUCHIO, KATE, VINCENTIO, GRUMIO, with Attendants. Petruchio leads Vincentio to the door of Lucentio's house, and Vincentio invites his new friends in for a drink at the house of his son. But when he knocks at the door, the Pedant appears at the window, pretending to be Vincentio. The Pedant declares that Vincentio is an impostor, pretending to be Vincentio, and calls for him to be arrested. Biondello, returning from the church where Lucentio and Bianca are getting married, is recognized by Vincentio, but denies every seeing him in his life. Vincentio beats Biondello; Tranio, Baptista and the Pedant come out. Tranio (still pretending to be Lucentio) also accuses Vincentio of being a con-man, and he and Baptista insist that the impostor be taken to jail. (5.1.110) Enter BIONDELLO, LUCENTIO and BIANCA. Just as an officer is about to haul away Vincentio for posing as Vincentio, Biondello enters with the newly married couple, Lucentio and Bianca. Biondello urges Lucentio to keep up the ruse, but Lucentio kneels before his father, and Biondello, Tranio and the Pedant all run away, "as fast as may be." Lucentio confesses all, and in a few moments the two fathers, Baptista and Vincetio, are persuaded that all is well with the marriage, though they are still fuming about the knavery of Tranio and Biondello. (5.1.142) Exit [all but Kate and Petruchio]. After all the confusion and rushing about, Kate wants to follow the rest and see how everything turns out, but Petruchio asks for a kiss. After a little hesitation about kissing in public, she gives him a kiss. (5.2.1) Enter BAPTISTA, VINCENTIO, GREMIO, the PEDANT, LUCENTIO, and BIANCA; [PETRUCHIO, KATHARINA, HORTENSIO,] TRANIO, BIONDELLO, GRUMIO, and WIDOW: the Servingmen with Tranio bringing in a banquet.Everyone is gathered for a feast in honor of the three of weddings: Kate and Petruchio, Lucentio and Bianca, and Hortensio and his Widow. Hortensio's wife makes a shrewish remark, and then expresses her opinion that Kate is still a shrew, so a little cat-fight breaks between her and Kate. Bianca intervenes and leads the other two women away for some private time. As soon as the women are gone, the men bet on which wife is the most obedient. Biondello is sent to summon Bianca, but she sends word that she's busy; Biondello is sent for Hortensio's wife, but she sends word that the men must have "some goodly jest in hand"; Petruchio sends Grumio to "command" that Kate come, and she comes immediately. Then Petruchio sends Kate to bring out the other two women. She does so, and Petruchio and Kate put on a show. Petruchio tells Kate to take off her cap, and she does so, and stomps on it; Petruchio tells her to tell the other two women about the obedience they owe their husbands, and she does so, with great gusto. She ends her speech by kneeling and offering to put her hand under husband's foot, but he raises her up and asks for a kiss, which she gives. So all agree that Petruchio has won the bet and tamed the shrew.